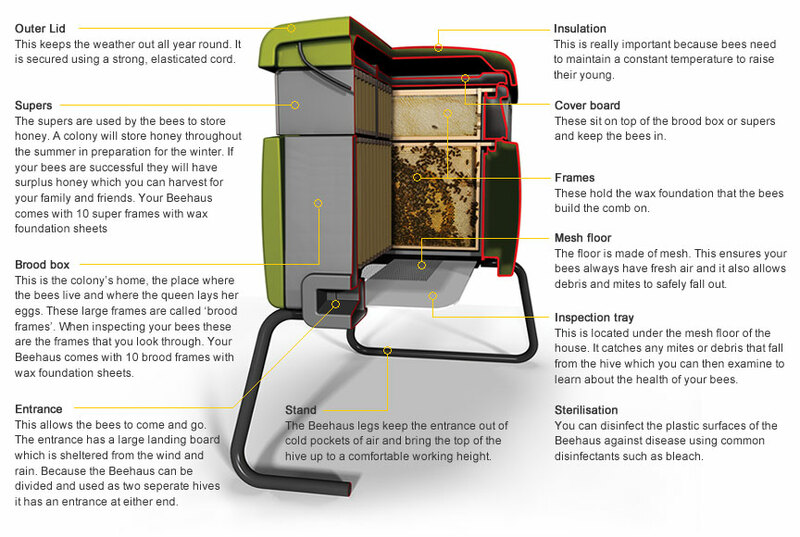 The Beehaus is a new kind of beehive specially designed for keeping bees in your garden or on your rooftop. Developed to provide your bees with a safe, modern home in which to live it, this easy beehive makes beekeeping straightforward and fun. This plastic bee house comes complete with everything your bees need, making keeping bees for beginners simple in the country or city. Beekeeping is a fun, social and rewarding hobby. 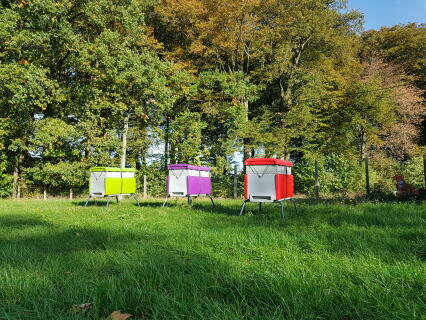 The Beehaus from Omlet makes keeping bees and collecting your own honey fun and rewarding. Bees are probably the most fascinating and certainly the smallest food producing animals you can keep at home. Now you can enjoy the amazing experience of beekeeping in your own garden or even on your rooftop. 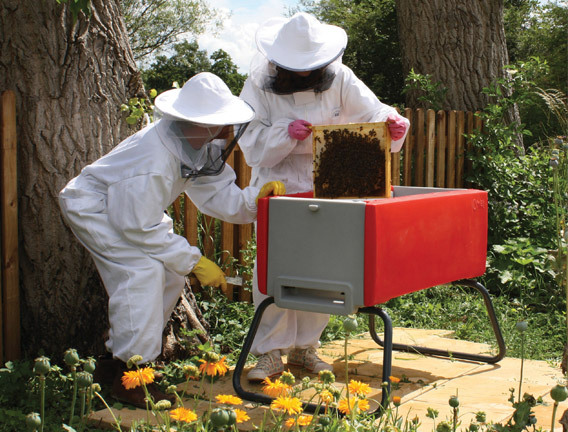 The plastic Beehaus beehive comes complete with everything you need to get started with beekeeping, you'll receive all the extras such as frames and wax foundation that you need before your bees arrive. Inspired by the way bees live in the wild and building on the classic principles of beekeeping, you will find the this bee house a delight to use. 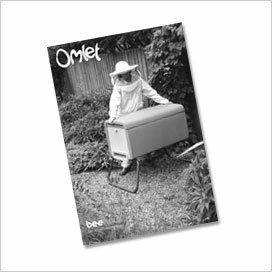 Omlet's service and support will give you all the confidence you need to keep bees in your garden. The Beehaus has two entrances, a central divider and space for two colonies. 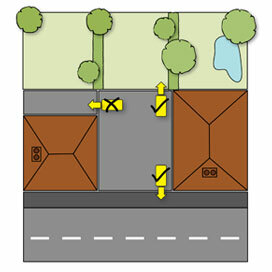 The plastic beehive brood box has two entrances - one at either end. There is enough space to accommodate 22 frames, which is double the number of frames in a traditional National hive. 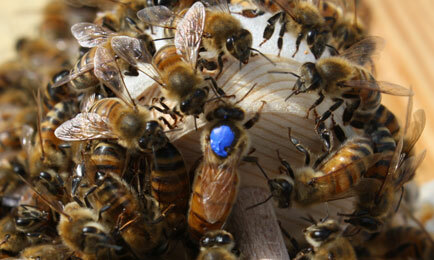 In spring when the queen is laying at her maximum rate your bees will be rapidly expanding in number. 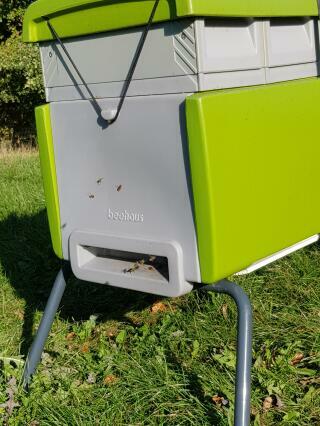 The extra space in the Beehaus allows you to either a) expand the hive as a single colony or b) divide the hive in two and start a second colony. This is an effective method of managing your bees’ natural urge to swarm. Modern bees need more space than they did in the past because queens have been bred to be more prolific egg layers. 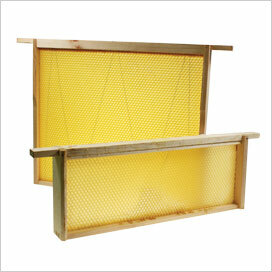 The Beehaus uses deep National frames (14”x12”) that allow the whole colony to live in a single brood box. This simplifies inspecting your bees and is less disruptive to the bees compared to being housed in a double brood box system. Your bees will be calmer and easier to work with. The supers are easier to lift and handle than traditional supers. No more bad backs from lifting! The Beehaus comes with four ‘supers’ for the bees to store honey. 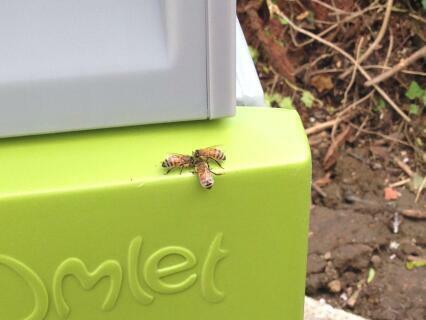 You place these boxes on top of the hive in the spring when the bees start collecting nectar. 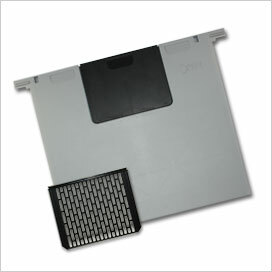 The supers use a standard National super frame. 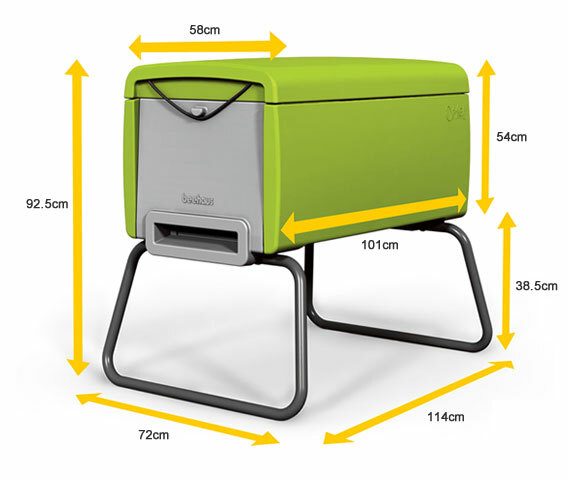 However for easy handling, the Beehaus’ super boxes are half the size and therefore half the weight of a traditional beehive super box. 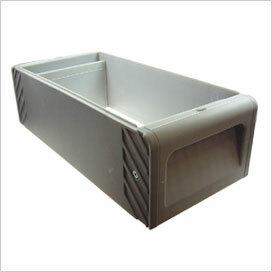 This plastic beehive comes with a stainless steel entrance block useful for temporarily closing the hive. 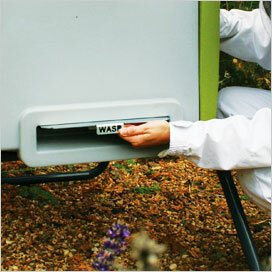 The wasp guard turns your hive into a fortress that the bees find easy to defend. 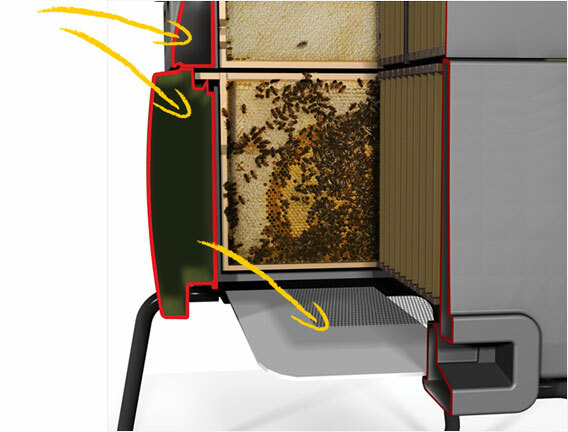 The lid and honeyboxes are held securely to the base of the Beehaus by a strong cord which is quickly fastened at each end of the hive. This is located under the mesh floor of the house. It catches any mites or debris that fall from the hive which you can then examine to learn about the health of your bees. How does the Beehaus work? Bees need a warm, secure and dry place to live. In the wild, bees make their nest in a variety of places such as hollow trees and holes in rocks. Beehives were developed to make it easier to manage a colony of bees and collect honey. The diagram below explains the different parts of the Beehaus and their function. 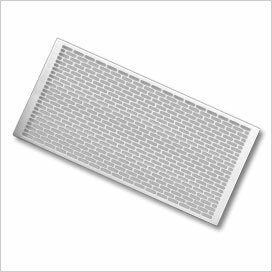 Twin Wall Insulation keeps your bees cool in the summer, and warm in the winter! 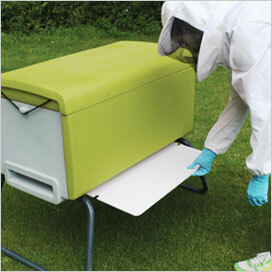 The innovative all-round double layer insulation helps keep your bees warm in the winter and cool in the summer. This is important as bees need to maintain a stable 35°C in the hive. They control variations in temperature by vibrating their bodies to generate heat or by using their wings as fans to circulate cool air. 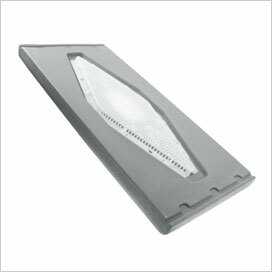 The bee house mesh floor ensures your bees have good air flow within the hive. 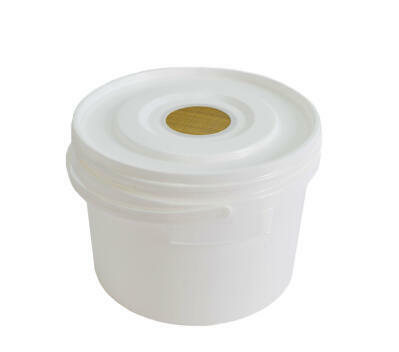 It also allows debris and mites to fall out and this helps keep your bees healthy. 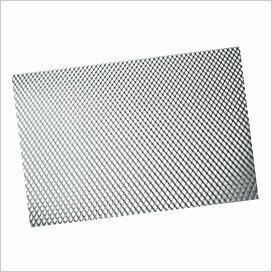 Mesh floor and inspection tray. Pick the colour which suits your garden. 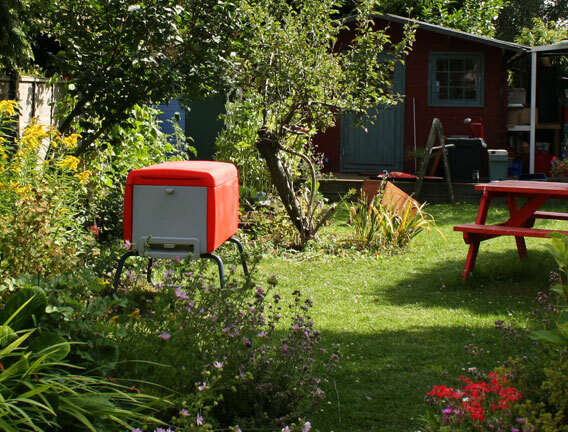 This modern beehive will bring your garden to life. Its compact shape means that finding a suitable spot is easy and the large range of attractive colours will suit any garden. You can keep bees whether you live in a town or the country. Bees are kept very successfully in urban gardens and rooftops where they forage in gardens and parks. 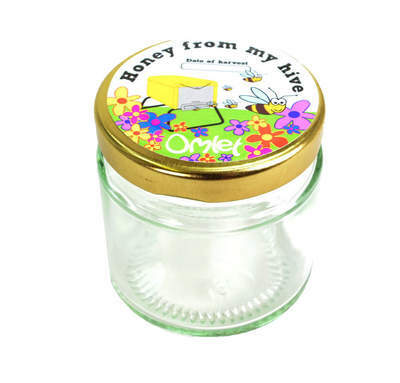 Urban honey has a delicious flavour from the wide variety of plants available. In the country bees can collect nectar from crops, orchards and wild flowers. The Beehaus comes as a complete hive ready for you to keep bees. 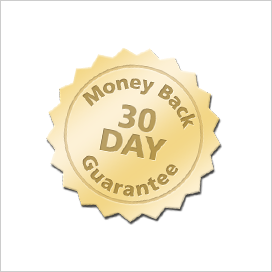 Not only that, we’re so confident you’ll love everything about the Beehaus and your new bees we offer a 30-day, no-quibble money-back guarantee. 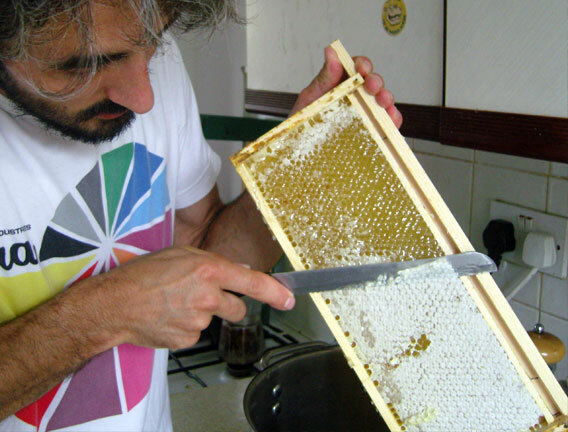 Each super holds 5 frames - enough to store approximately 7-8 kgs of honey. These fit on top of the supers and the hive to seal the bees in. These are used to empty bees from the supers or feed the bees. 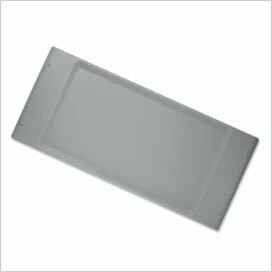 10 deep National brood frames and 10 National super frames - including wax foundation. Converts your Beehaus into two separate hives. 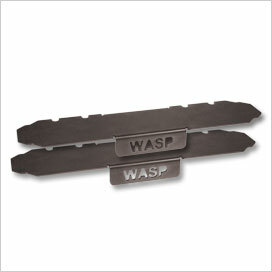 This ensures your bees have fresh air all year round. Shows up anything that drops out of the hive. A complete guide to keeping bees packed with useful advice Download Now For Free! Still taking wine to dinner parties? Your own honey is much more exclusive. 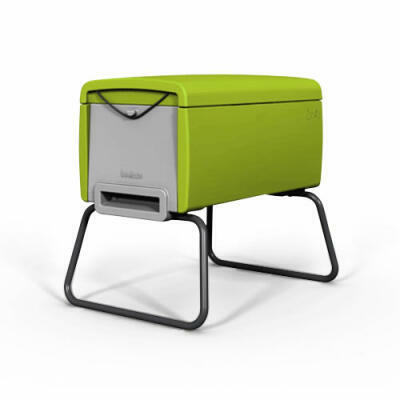 If you are not entirely satisfied with your Beehaus, you can send it back for a full refund. The Beehaus is raised off the ground on sturdy legs. 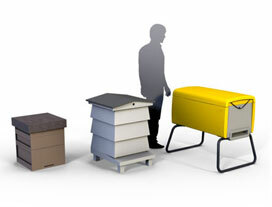 You don’t have to bend to lift heavy boxes as you do with traditional hives. 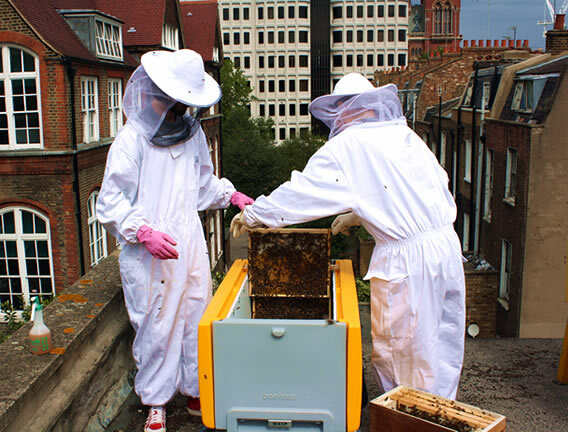 Having the top of the hive at a convenient height and with space alongside to rest tools makes the job much easier. 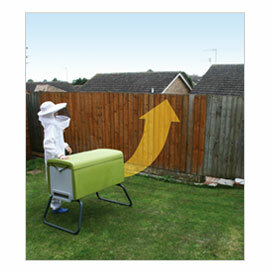 An ideal spot in a garden is against a hedge or fence to protect flying bees from the wind and rain. 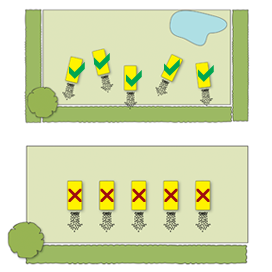 You should position the hive entrance so that the bees can fly in and out in a straight line. A quiet spot in the garden away from frequently used paths is best. If you have neighbours then you can encourage your bees to reach their normal flying height quickly by planting a hedge or placing a fence approximately 2m in front of the hive. Bees normally fly above head height at about 5m above the ground. If you live in a town and have a flat rooftop this can make a great spot to keep your bees. They can fly in and out of the hive undisturbed and will have a great view. Transferring your bees to the Beehaus. We Can Help Find Your Bees too! Omlet can supply you with a list of suppliers in your area where you can source your colonies from. 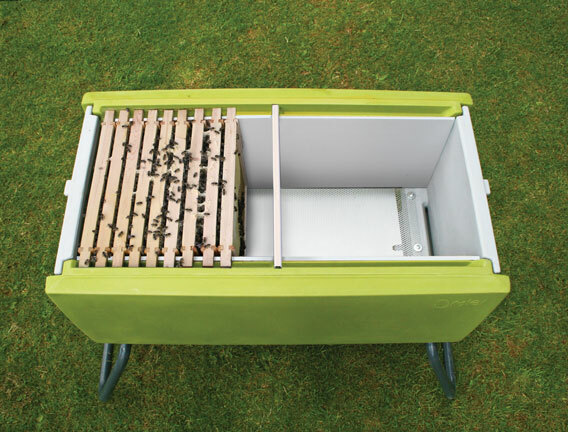 Bees are typically supplied on six frames which you can put straight into your beehaus. As the old beekeepers' saying goes, "There's nothing better than spreading thick, delicious honey onto a slice of piping hot toast - except when it's been collected by your very own bees!" Naturally, your bees wouldn’t expect to be able to live in such magnificent accommodation as the Beehaus rent free. You can collect an average of 50 jars of honey per year - although in a good year a colony may produce up to 100kg of honey! The amount depends on the size of the colony, the weather and the quantity and quality of the nectar near the bees. You’ll need to leave your bees with between 10 and 15kg of supplies to see them through the winter. The simplest way of harvesting the honey is to uncap the comb and then scrape the honey into a colander which is sitting over a large container. The honey will drain from the wax into the container below. You can further strain the mush of wax by wrapping it in muslin cloth and the beeswax can then be used to make soap, candles, furniture polish, and a whole range of other useful things! 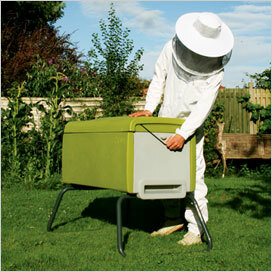 Every beekeeper needs a beesuit with sturdy gloves, a hive tool and a smoker. 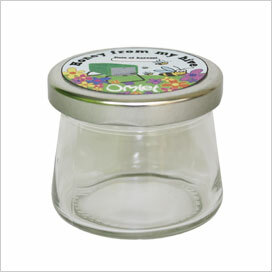 Omlet has the best available and you can order them as part of the Beehaus Starter Kit package for only £30! 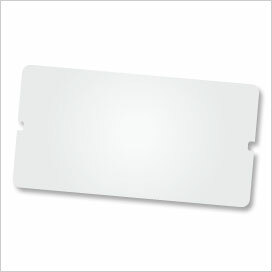 This saves you £90 over the cost of buying them separately. 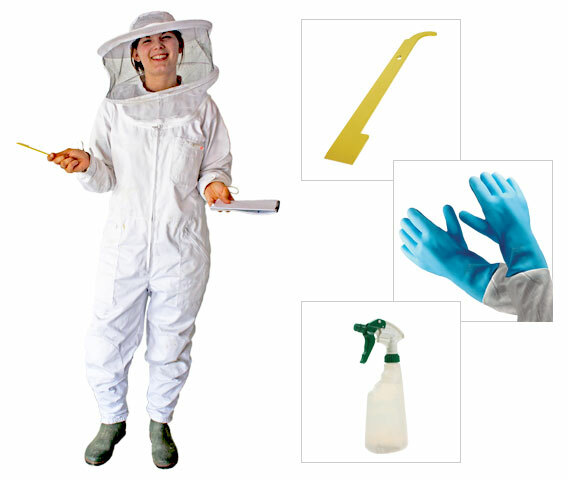 You can purchase additional beesuits, gloves, smoker and tools in our beekeepers supply shop. The full-length professional Beekeeper’s suit with veil will mean you can get close to your bees in safety. It can even be washed in a normal washing machine. Our top-quality rubber gloves with gauntlets are just the thing to give you confidence when working with your bees and can be washed clean. No need to use a hot, dangerous smoker to calm your bees - we supply a modern liquid smoke atomiser. You receive 50ml of concentrated liquid smoke and a 600ml atomiser. Simply fill the atomiser up with water and you’re ready to go. Our heavy-duty steel hive tool makes opening the hive and lifting frames a doddle and give you years of reliable use. I love my Beehaus - have kept bees in it successfully for 10 years and wanted to reassure you that you are buying 5* accomodation for your bees. They work less hard to heat the hive - survive winter beautifully without condensation problems and damp and now that I have hybrids are producing lots of honey too. Today I used one of the clearer boards overnight and had the most peaceful removals of a super of honey ever! Plus like most people I do not have time to commit to club - join association to get insurance please! Your manual has been my beekeeping bible and as they say I learnt everything from it! Well done Omlet - the hive looks as good as it did 10 years ago and it is still a joy to watch those fiery streaks rising into the sky on every sunny day. I am now Press Officer for the BBKA but this is a personal review. I would encourage every back challenged person wanting to keep bees to consider a Beehaus. I am 60 and want to go on beekeeping for as long as I can and this hive makes it possible. The Beehouse got its bees this evening and it amazing. The Haus itself came well packed and with sime easy to follow instructions. It was very easy to transport and put in place. It is well designed and protects the bees from the elements. I have only had my Beehaus just over a month. I bought it to house a swarm from my other hives, but I had to modify to house a 2nd swarm soon after. The bees in both colonies are very placid & so must be happy in their surroundings. 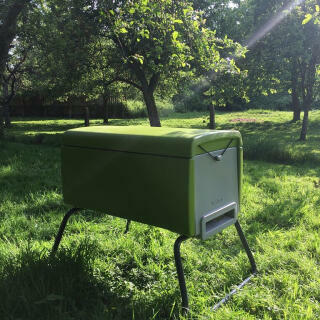 I am used to WBC hives, but I would recommend somebody just starting out in beekeeping & has limited space to look at the Beehaus as an alternative, in several ways they are more 'user-friendly' than standard type hives. My colonies are still building the brood & have yet to start building up stores, I will review when this happens. I kept bees 30 years ago in a WBC and I decided to restart this year with the beehaus. 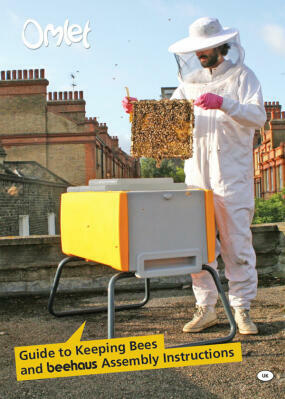 I liked the look and the concept of two in one or one large insulated hive. I was a little surprised as to how big it actual was and how heavy. The first hive that was sent was slightly 'out of true' and so the top boards would not stay in place, but there was no quibble from omlet who replaced it immediately. The service was excellent, and I now await my nucleus, hopefully my bees will like it as much! 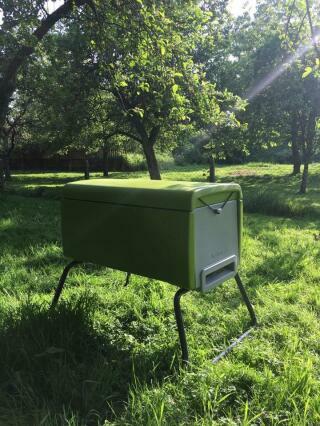 Recently bought the Beehaus and I am very pleased with my purchase. It was easy to put together and really well made. The instruction booklet that came with it provide really clear instructions and also gave brilliant advice on looking after the bees.